October 11th is National Pet Obesity Awareness Day! Just like us, dogs and cats need their weight monitored as well. 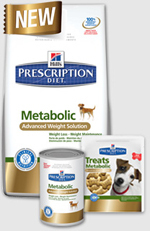 Hill’s Science Diet Metabolic Diet is a great way to help your four legged friend lose weight and live a happy life!